The easy answer is, it’s complicated. It depends on how you plan to use Elasticsearch. When organizations adopt Elasticsearch, one of the first decisions they need to make is where the data center will be located, and whether the location truly matters for functionality. Many factors play into this choice. Ultimately, it comes down to how they intend to use Elasticsearch. What is the best practice for Elasticsearch data center locations? The developers of Elasticsearch have several recommendations when it comes to data center locations. Their ideal configuration is having all of the nodes on the same local network. They don’t recommend distributing a cluster to multiple data centers, as the potential for disruption creates performance issues and data availability concerns. This setup reduces the risk that latency leads to problems with the Elasticsearch implementation that the organization uses. However, it may not make sense for an organization to put their Elasticsearch instance in the same data center as their core offering. It may be cost-prohibitive compared to an alternative data center, or the business wants to introduce better geographic coverage. When does location matter the most? One of the use cases that benefit the most from having Elasticsearch in the same data center is site search. Consider an auto-complete feature that predicts what the end user is looking for. Latency causes a lot of problems in this case, as the user may finish their query before the auto-complete function even has a chance to return results. The search needs an immediate response while the end user types the letters, so it makes sense to have the data store in the same data center as the app (or as close as possible). When does location not matter? One of the most popular use cases for Elasticsearch is logs and log analysis. Organizations don’t need this functionality to work at real-time speeds. The concern about the milliseconds between typing letters is gone. Instead, the company is looking at what happened an hour or longer ago. Latency doesn’t come into play in this situation unless it’s particularly egregious. If this data is stored elsewhere, such as in a less expensive data center, then it’s not going to be a big deal. The company can take the funds saved and use it for other critical areas that receive a much bigger benefit from performance boosts and real-time availability. Is there any difference between hosted Elasticsearch providers? Developers may look at the number of hosted Elasticsearch providers and wonder if they’re all the same. The truth is, that not all Elasticsearch providers are the same. When developers don’t necessarily have the time or resources to build out their own ELK stack for a platform that they’re working on, the provider can make a big difference in the success of the project. Typically, the company will have the Logstash part of the stack living in their own environment, but Elasticsearch and Kibana benefit significantly in a hosted environment. One of the first factors to look at in a vendor selection is how well they streamline the deployment and management process of Elasticsearch clusters. Developers who don’t have to spend most of their time trying to make sure that their databases function properly can focus their energy on the application itself. After all, they didn’t sign up to be database administrators. Next, look at the full range of service offerings by the provider. If they only work with Elasticsearch, then the company would have to use multiple vendors to get a fully hosted ELK stack. In addition, if they have latency-sensitive use cases, they wouldn’t be able to host their application in the same data center. 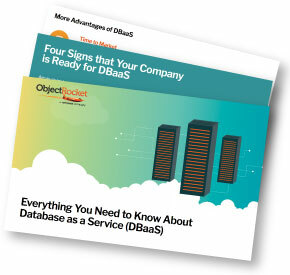 DBaaS providers supporting multiple types of databases work out better in the long-run. Support is another critical area to evaluate. The database needs to work 24x7x365, so the provider’s support should as well. Since Elasticsearch is a complex solution to work with, ensure that specialized database administrators and engineers are on the other end of that support line. Finally, the safety of the company’s data matters. Talk to the provider about the security measures they have in place. The Elasticsearch data center location can be a complicated decision to make, so it’s important that organizations have a flexible hosted service provider willing to work with their current and future requirements.